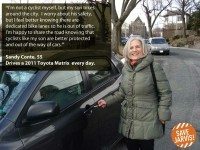 Nominated for: making Toronto more angry, more congested, and less safe. 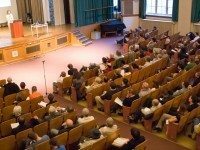 Protests managed to slow the removal, but it's still happening. 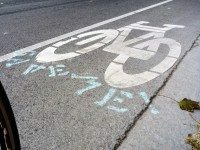 Arts and culture writer Steve Fisher explains why he sat down in the middle of a bike lane to protest its removal. Power scrubbing to resume tomorrow after sit-in halts a work crew today. 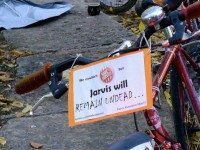 Cyclists protested the impending removal of the Jarvis Street bike lanes with a special zombified edition of the monthly Critical Mass bike ride. 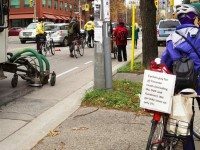 For a second year, cyclists take to Jarvis street to protest the planned removal of its bike lane. 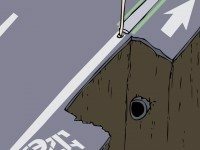 Cyclists were all fired up and all in agreement as bike lanes dominated a public discussion last night. 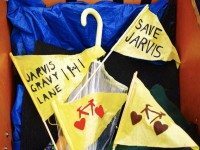 If you drive, and like Jarvis Street the way it is, Dave Meslin wants to hear from you. Glad Hand: Jarvis, You’ve Gotta Fight, For Your Blight … To Par-tay!